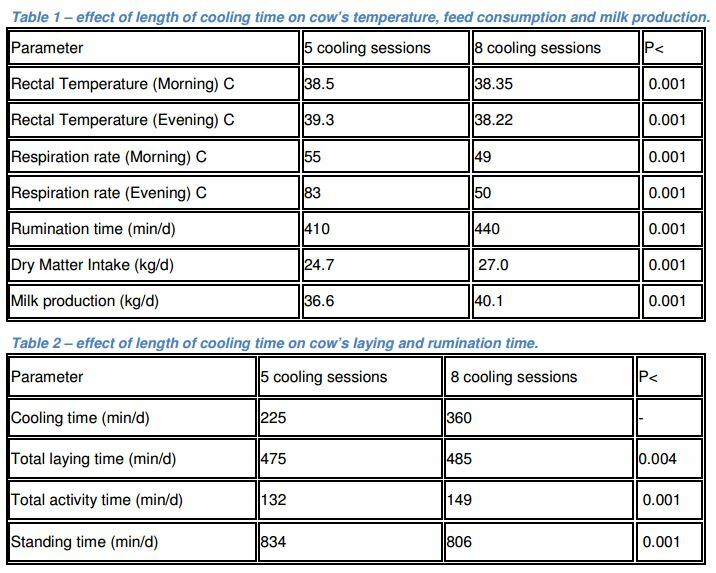 Cooling cows has become a common practice in many dairy sectors in the world, especially in warm regions. impact of heat stress and cows cooling on animal welfare and the environment. greenhouse gases to the atmosphere and therefore, their impact on global warming (1,2). friendly, by reducing dairy sector contribution to greenhouses effect and global warming. 3.75 hours (5T), while the other group cows were cooled 8 times per day and a total of 6 hours (8T). body temperature, cows resting and rumination time. Results are described in Tables 1 and 2.
house gas emission to the atmosphere, making their farm more environment friendly. Gas Emission at Farm and Manufacturing Levels” , Bulletin 422/2007. Dr. Torsten Hemme from IFCN institute in the summit). sessions daily under hot and humid climate. J. Dairy Sci. 95:3736-3742. (2012).